Dallas has all the stereotypical Texas sights: stockyards, rodeos, cowboy hats, boots and steak houses. But it’s also got a thriving arts district and street food scene, and, as long as you can battle with the 35 degree heat, it’s a great contrast to see both sides of this sprawling city. Downtown, the Klyde Warren Park hosts free art and sports lessons and very handily has free wifi – great for blogging in the sunshine. It also has an outdoor reading and games room, with fiction, newspapers, magazines and board games for hire. The reading room is sponsored by The Dallas Morning News and it’s a great idea – we sat down to enjoy the sunshine and take in all the street food trucks and live music dotted around the edges of the park. Dallas has the slightly morbid fame of being the place where JFK was assassinated on 22 November 1963. We went to the historic West End to see the sixth floor book depository window. From here, the fatal shot was fired at JFK and Jackie’s open-top car as it made its way through Dealey Plaza, towards the underpass and on to the Dallas Trade Mart for lunch; the next stop on their tour of Dallas. We didn’t go up to the Sixth Floor Museum, but it was interesting to walk round the plaza. That evening, we drove nearly an hour out of Dallas to Fort Worth Stockyards, in time for the Saturday night rodeo at the Coliseum. 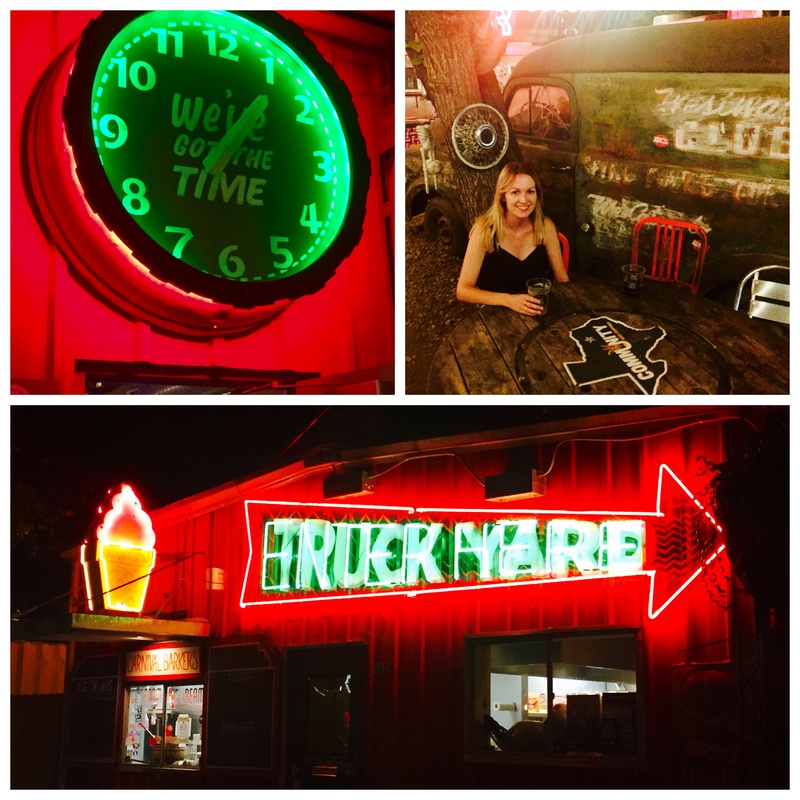 We had a look round the small town, with its BBQ joints and saloon bars, and had our first taste of Texas flame-grilled steak at Riscky’s BBQ – a great choice, despite the name! The rodeo was an experience like no other. Nearly everyone was wearing checked shirts, jeans, cowboy hats and boots, and in a non-ironic way. Everyone stood to remove their hats, put their hand on their hearts and sung first a song to commemorate the US military and second the Star Spangled Banner, as a cowgirl rode round the arena with the American flag. 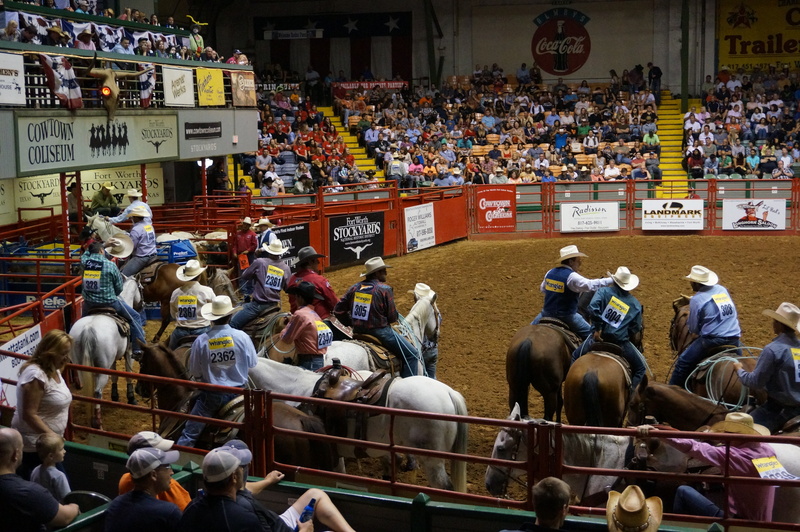 The cowboys competed in a number of different categories for some big prize money – rodeos are a serious business in this state. We watched calf lassoing (singles and doubles), bull riding, and horse skills. A true Texan experience. For a lazy Sunday, on our Airbnb host’s recommendation, we went for brunch at Bolsa, in the Bishop Arts District, not far from where we were staying. There are lots of art galleries and printing presses, as well as outdoor cafes, restaurants and bars. These few blocks have a great atmosphere and sense of community in a city which can otherwise seem just a vast expanse of commercialism. 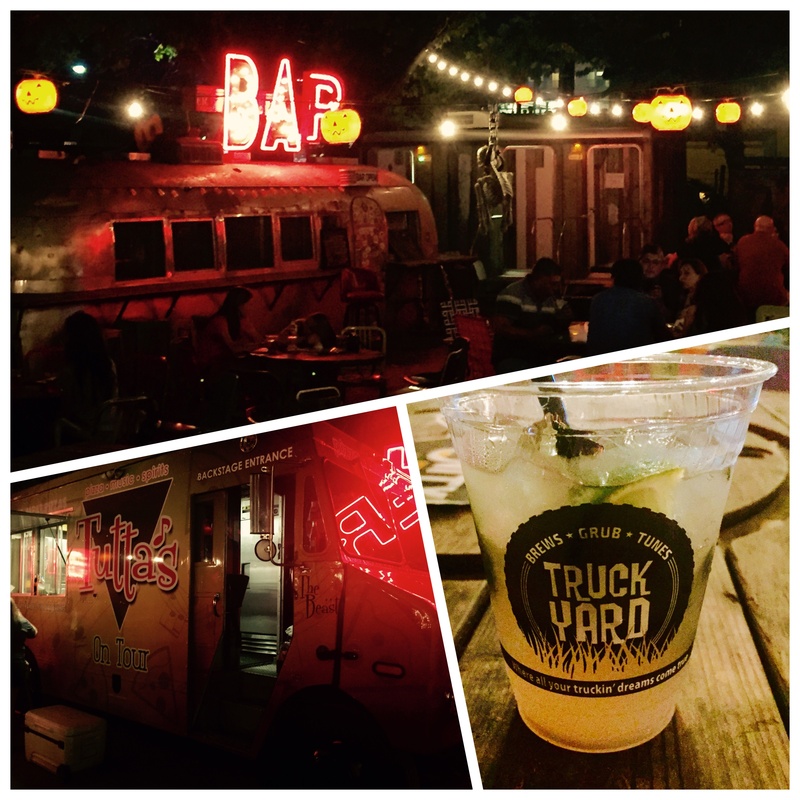 We finished our stay in Dallas with a trip to Lower Greenville to check out Texas Truck Yard, a large outdoor space with food trucks and bars scattered around. The Texas -Toronto baseball game was on the big screen so the yard was heaving and had a great atmosphere. Although we were too full to try the street food, the mojitos served on draft were very good indeed!